Last week TD and I went to the Metropolitan Opera with our friends Brian and Jonathan. We saw Der Rosenkavalier by Richard Strauss. Dear reader, it was four and a half hours long. We got there at 7:30 and got out at midnight. Two intermissions offered the chance to stretch and circulate. That's a lot of opera, and I'm not an opera expert, but it was beautiful. Der Rosenkavalier (The Rose Cavalier) was written by the German composer Richard Strauss in 1910. Set in Vienna in the 1740s, it's a comedy of errors and involves a lot of masquerading and false identities. Honestly I didn't follow all the twists in turns in plot even though the subtitles are elegantly displayed on the back of the seat in front of you. The confusion for me started when the curtain went up and the fantastic Renee Fleming as the princess Marschallin was in bed with her young lover - a woman - played by Susan Graham. A lesbian love affair! But no. Strauss dictated that the much younger male lover be played by a female for the sake of the mezzo-soprano voice. Ok! 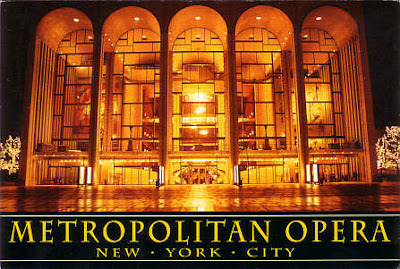 The Metropolitan Opera House holds almost 4,000 people. We were sitting at the tippy top of the house, in the family circle. $22 seats. There were elderly people climbing up very steep steps to get to their seats. I had said to TD, "Will we be able to see?" He said, "You can listen to the music." The acoustics were clear as a bell. That was astounding. And the music was heavenly. The production was an eyeful too. Pictured here is the second act. The set featured a white and black marble floor and tall paned glass doors which swung open. White wigs, pale costumes – kind of a Viennese dream. I'm interested in learning more about opera because it's a living work of art history. It's like a Henry James novel or a Sargent painting, but it moves and breathes in front of your eyes. This opera first premiered in Dresden in 1911; I wonder what Dresden was like in 1911. In 1913, this opera debuted at the Met in New York. At that time, the Metropolitan Opera House was located at Broadway and 39th Street. Edith Wharton writes about going to the opera there in The Age of Innocence. In the last act of Der Rosenkavalier, Renee Fleming regally entered in a fantastic silvery gown. She floated around the stage, and she and the two other female leads, Susan Graham and Christine Schafer, sang the beautiful famous final trio, a gorgeous blend of female voices for which this opera is renowned. The last twenty minutes were breathtaking. Then it was midnight. 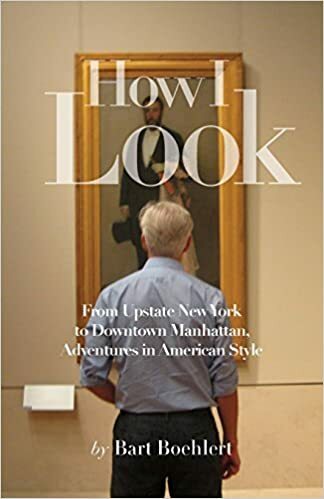 Almost 4,000 New Yorkers flooded down the stairs and out into the bitter cold of the Lincoln Center plaza, into cabs, buses and subways, home to bed with glittering visions of eighteenth century Vienna dancing in their heads. oh lovely -i still have never been to the Met, but have seen operas from there recorded on tv (ghetto -maybe). I do have season tickets to the opera here in dc at the kennedy center though - you're right -it's a mix of many different art fields and impossible not to be fascinating! And you saw the divine renee, whom I adore. She's such a lovely lady, I met her at a benefit years back while in school at Pittsburgh. Enchanting voice for an enchanting lady. correction -my watching opera on tv is ghetto -not the met, obviously! Hi AD, all media are good! Last night we heard Carmen live from the Met on the radio. Yes -i listen to the MET live every weekend on npr! Muscato, I think you should, I would love to read it! Bart -- Envy doesn't begin to describe the word I feel when I read your post here! Is that photo from the current MET "Rosenkavalier"? And Renée Fleming was the Marschallin. Lucky you. This is one of the very best operas in the whole opera genre -- what a lovely libretto with so many truths about life in general! 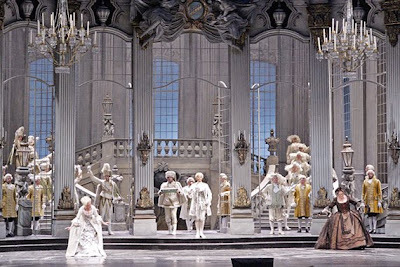 I just wrote about "Rosenkavalier" on my own blog this past December, in which I featured the original 1911 sets -- would love to hear your thoughts on that. PS: Do you speak German? The German -- or better, faux-Viennese of the libretto is so wonderful. Hi Michael, this photo is the current production, the production dates from 1969 I believe. Unfortunately I don't speak German -- I will visit your post! At that time, the Metropolitan Opera House was located at Broadway and 39th Street. Edith Wharton writes about going to the opera there in The Age of Innocence.Great stuff!